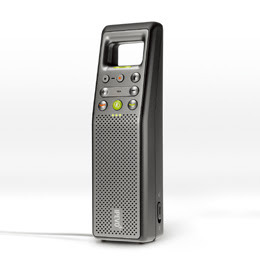 Ipevo's new TRIO USB Speakerphone is ideal for hands-free Skype conversations and small group conferencing. Its voice quality is optimized for Skype with full duplex technology and 16 bit DSP with echo cancellation. Mic and speaker all in one, TRIO can be placed in an upright position as a hands-free phone with voice reception of 1.5 m2. Conversation can be carried on while walking, lying down or even playing games! At times of needing privacy talks, TRIO can be switched to handheld mode with simple toggle switch. TRIO is also a high quality recorder with inbuilt recording software to accommodate the needs of Skype conversation and sound recording. The audio files are outputted as WAV format.